My colleague and friend Brian Lee shared with me a fantastic book on singing, written by George L. Osgood. In it, we find a cogent description of how the voice should be united through its TWO registers – chest and head/falsetto. George L. Osgood’s book, “Guide in the Art of Singing” was published originally in 1874 and offers a still-relevant description of pedagogical thought which was connected to an earlier tradition. Osgood describes the two registers of the voice and even includes a graphic that bears a striking resemblance to ones offered by Ingo Titze in the present day. Osgood acknowledges that the 19th century addition of a third register in women’s voices was a French undertaking. The oldest writings of the Italian bel canto (defined as the period from the 1600s to 1810), list only two registers of the voice. Johann Friedrich Agricola, who edited and translated Tosi’s book, falsely added (in a footnote) a third register based on his own preferences and as a hat tip to the Zeitgeist. Tosi clearly delineated only two registers in his work. Osgood’s process for vocal development is a good one. He advocates the PRIMARY development of the chest register as a first step to ‘find the voice.’ However, if the voice was inversely raucous and loud, it should be softened. Before attempting to blend the registers the pupil should be firmly established in pure chest tone. Though many possess naturally strong chest voices, those cases are rare where, in an uncultivated singer, the chest tones do not have to be properly located at the beginning of study. In teaching the singer to pose these tones correctly, a careful distinction should be made as to the kind of defect to be removed. For every defect there must be a particular remedy, but it does not follow that every remedy can be applied to any defect. Robust, crude, and screaming voices must be sweetened and purified. Hence, if such a pupil be made to give at once the full voice, so far from correcting, it will magnify these defects. The proper method in such a case is to teach the singer to retain the voice at a moderate degree of power. Constant attention is necessary that the voice be never screaming and never forced, especially in the higher tones of the register, so that it may become equally proportioned. The pupil must be made to practise for some time an exercise in slow tempo,which shall pass from the lower to the middle tones, and thence, at the proper time, to the higher. 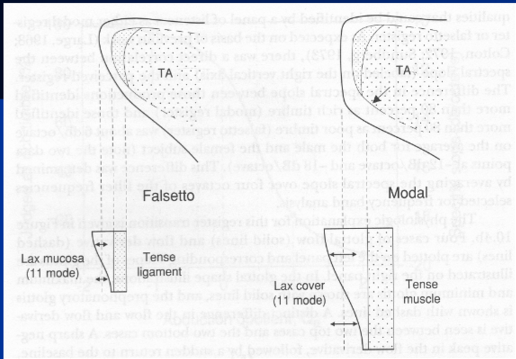 Osgood has clearly outlined working the two registers based on the presented CONDITION and diagnosis of vocal mechanism. This functional diagnostic holds to the present, and is a direct reflection of the usage and condition of the vocal registers – it is also good pedagogy. Most voices in the early stages of development MUST be exercised in a robust chest voice, which develops over the course of several weeks and months. For Osgood, this was to be done first, before any register unification was to take place. Once this development of chest voice had been undertaken, the student would be prepared to unite the chest and the head registers together. Having thus firmly established the pupil in pure chest tone, the master should pass to the study of uniting the chest with the head register. It has already been explained how to recognize the immediate point of separation of the registers. (ed. Osgood places this in ALL voices at E4) Knowing, therefore, the last tone of the first register and the first tone of the second, the teacher can proceed with certainty in his instruction. The separation of the chest and head registers, which is abrupt in one person, may be gradual in a second, and in very rare instances it may be difficult for any but a sensitive ear to detect where one register ceases and the other begins. Osgood is also VERY perceptive in his remarks on the female middle voice, an area of the voice where the two register mechanisms overlap. For many women this area of the voice can lack substance. The incorrect way to strengthen is to drag the chest register into it (a type of singing that can be heard in the example of Maria Callas, who because of register imbalance would push her chest voice throughout the overlap for added drama. When the chest voice was pulled out of the middle voice in subtle passages her intonation sagged flat. Osgood prophetically describes Callas’s condition in the second paragraph below). The complaint of female singers of loss of power in their medium tones has already been referred to. The thinness and weakness of these medium tones — called by the French school falsetto— is caused, in the majority of instances, by practising them with the heavy quality which is natural to the lower series of chest tones only. Pupils who have been taught to employ this heavy quality in the beginning of their studies, find it difficult to use any other when they approach the middle tones. They are therefore forced to extend it beyond its natural limit. Such a false method subjects this portion of the voice to a very unnatural strain. The vocal chords become fatigued and weakened, which reacts upon the tone, rendering it thin and characterless. If persisted in, the weakness will extend itself even to the lower tones, and thus through one false step almost the entire lower portion of the voice becomes a ruin. This happens oftener with mezzo-sopranos than with any other class of voice. The true mode of procedure here is to teach the singer to retain the lower chest tones at a very moderate degree of power, and to diminish this power still more as the voice approaches the medium tones. It is expedient also to take breath at the middle tones as little as possible. Extraordinary care must be observed that there be no abrupt change in quality of tone in ascending or descending; that there be, therefore, no perceptible alteration in the position of the breath. The rules of respiration already given must be studiously observed. The Italian and English sounds of the vowel o will prove invaluable assistants in equalizing this part of the voice. Proceeding thus carefully the pupil cannot fail to render all these tones of uniform quality and strength. Having secured this important advantage, the singer may then resume the use of the forte in the lower chest tones. Osgood is right on the money here. His first approach is to MAINTAIN a gentler strength of the lower chest register tones IN THE LOWEST PART of the vocal scale. This prevents the inevitable dragging up of chest into the middle part of the voice. A British and Italian [o] vowel is absolutely useful in creating a unique resonance adjustment which will allow a better equalization of the lower and middle registers. Once the middle has been ‘de-thickened’ the power of the chest voice can be reinvigorated – BUT ONLY in the lower extent of the voice. As the chest voice is exercised, the medium tones (around the passaggio) may be exercised as well. Note below that Osgood is using VOLUME as a control factor for vocal fold depth. To sing loudly in the middle and upper voice in an instrument under process of equalization is to work at odds with unification. Throughout, a reduced volume will more gratefully unite the two registers. The study of the medium tones can be begun almost simultaneously with that of locating chest tones. As the voice approaches the vicinity of the head register, its power must never be more than a moderate one. The last two or three tones which precede the head register must never be delivered with full strength, so long as the upper and lower portions of the voice shall not have been completely blended. On the contrary, these tones should be sung at first almost in messa voce. With persons in whom the chest voice is strongly developed, and the head voice proportionally weak, no other method is safe than to moderate temporarily the strength of the lower register,and to strengthen little by little the obstinate tones of the head voice. This once gained,the lower register may then be allowed to resume the use of the forte. Should a student present with the OPPOSITE problem – too MUCH head voice, then the inversion of this process should take place. This same method applies also to voices whose registers are not much out of proportion. For the case in which the lower register is weak and the head voice strong, the order must be somewhat changed. 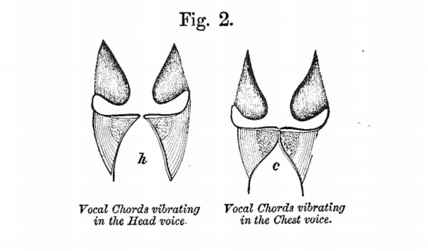 Here the strength of the head voice must be temporarily moderated till the strength of all the tones in the vicinity of the point of separation between the registers, both above and below it, shall be perfectly equalized, when the head voice may be allowed to assume its natural strength. The exercises to be sung must not require the pupil to breathe at the point of separation. With many voices, the Italian vowels o, u, as well as the English long o, prove very efficacious in blending the lower with the head register; though in such instances the master must guard against the tone becoming guttural. At the same time the head voice must be brought down as far as practicable. And in true bel canto fashion, Osgood ultimately acknowledges there is NO quick fix. Register unification is a lengthy process that bears fruit only after focused attention and discipline. Patient, methodical observance of these rules will surely bring its reward; disregard of them will leave the voice imperfect. Should the reader wish to explore Osgood’s book in greater depth, it can be read here. Previous postHow Did That Voice Get Ruined? Great post, thank you! Your finds are amazing. Enjoyed this post very much. You may know this already, but Osgood was a student of Ferdinand Sieber in Berlin, and then studied with Francesco Lamperti for 3 years in Milan. Author of Hidden In Plain Sight: The Hermann Klein Phono-Vocal Method Based Upon The Famous School Of Manuel Garcia. Yes! Mr. Osgood was also a Boston resident and a member of several musical societies here. I’m working to track down more info on him presently. Thank you for the connection to Francesco Lamperti – it fills in the gaps on much of his pedagogy. Best to you!